Garnier takes care of you with Summer Body Dark Gradual Tan Moisturiser. It intensely moisturises and gradually builds a natural looking tan in harmony with your skin tone. Specially developed for deeper skin tones, the formula contains a hint of tanning ingredient to gradually build a natural-looking even tan after each application. 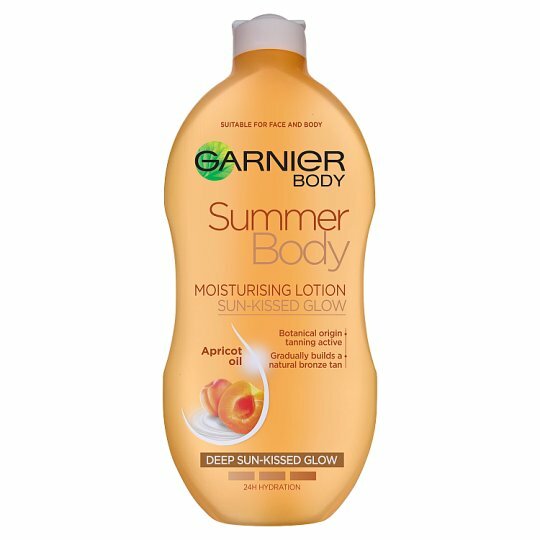 Enriched with natural extract of apricot, Summer Body intensely moisturises your skin all day long leaving it feeling soft and supple. Now suitable for sensitive skin. Apply lotion evenly all over the body for a uniform golden tan. Wash hands well after each application. May stain clothes. Avoid contact with fabric. Do not apply on face.